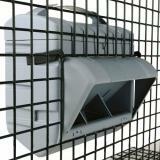 Specifically designed to be fixed to any vertical or angled (diagonal) cage. 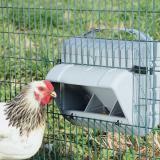 Best for feeding birds in caged runs. Increase feed capacity by adding a Silo Extender. 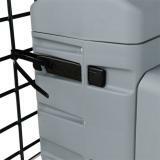 Provides easy access for checking feed level and refilling. 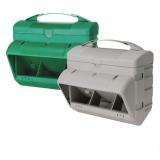 Accessible from inside or outside poultry runs for easy refilling. Use a Silo Extender to increase feeder capacity. Hooks onto cage for easy mounting. Includes rain hood that helps keep out moisture. Lid cleverly hooks onto the side of feeder when filling. Thumb screws easily adjusts feed level. Rolled lip discourages the scratching of feed. Small holes in the bottom of feeder drain away fine dust. Fix onto outside of cage and cut mesh to allow birds access to feed area only. If using on inside of the run, mesh does not need to be cut. 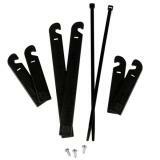 Includes installation hardware: Hooks for cage mounting, screws for rain hood and 2 tie straps. I have this in an enclosure with 10 medium-sized laying ducks. I use pelleted feed, and the 10 pound feeder and silo extender hold a little more than 2 days worth of feed (they free range too). I really like this product, because it keeps the ducks from stepping in the food, accidentally flipping it out, and soiling it (like they were doing with feed pans). They do shovel some food out of the feeder as they're eating, but putting a feed pan under it solved the problem. I only need to dump the feed pan if it rains and gets wet--otherwise they'll eat everything. 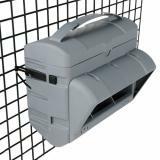 The Wise feeder keeps the feed inside it dry, as long as I use the included rain shield. Feeders are great. Have 8 of them on different pens. Saves on feed. Great product to save your feed. Ducks took to it right away. No more wet feed no more feeding crows and other birds and now up off ground so better control for rats diwn by lake. The answer to my small coop space issues - it's perfect!! Very easy to hang - I hung it on the inside & did not need to cut an opening. 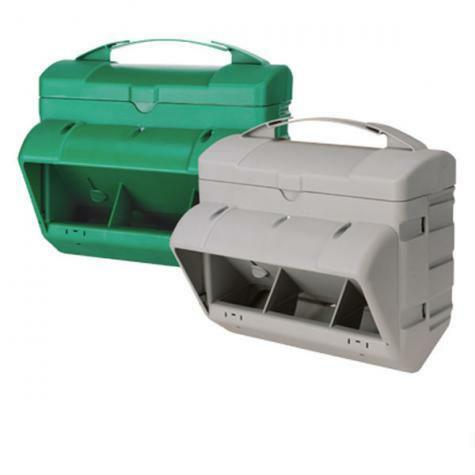 Holds a surprisingly large amount of food & feeds my small flock of 6 for days with minimal spillage. Note that crumbles or mash will not work with this. I actually switched to pellets to stay with this feeder!